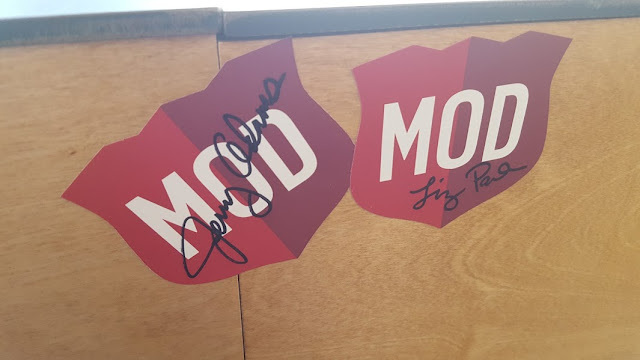 Today I was able to attend a media opening for the new MOD Pizza, located in Northville near the corner of Haggerty and 7 Mile. MOD has a "fast-fired pizza" concept, where your pizza is ready in 5-7 minutes, and you can choose one of their nine classic pizzas or create your own. As you may recall, I visited Blaze Pizza (Novi, Royal Oak) in April of last year, and the concept of MOD is the same; however, it definitely has some menu items that Blaze lacks. The first thing you will notice when you walk in is the decor - I was told that it's specific to the area. When you walk near the back of the sitting area, you'll see some Northville-specific vintage pictures, like the Northville Downs one above; I love vintage stuff, so that was very cool. 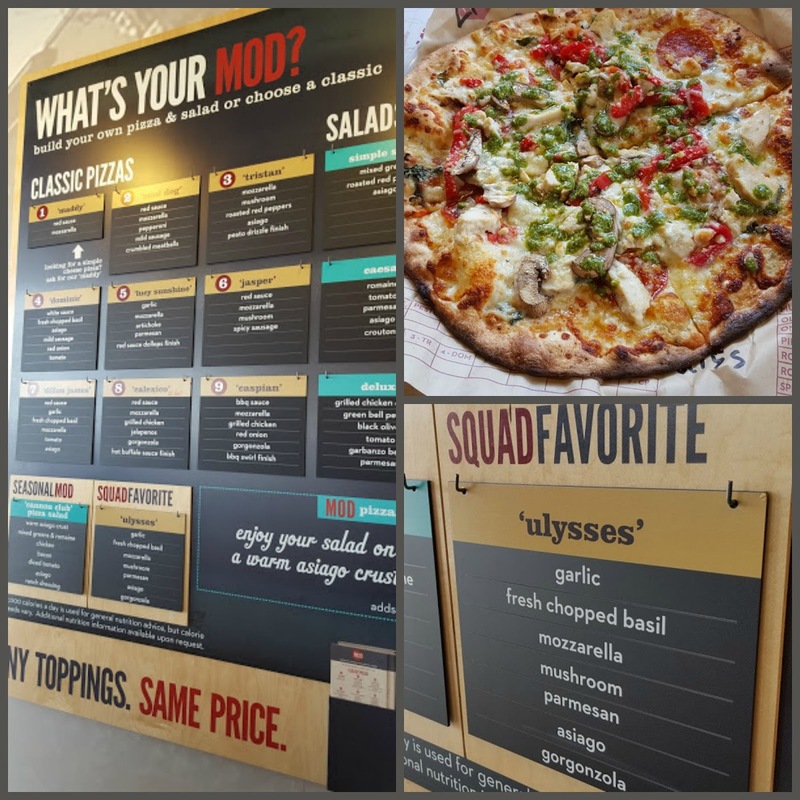 MOD Pizza Northville is operated by TEAM Schostak Family Restaurants (TSFR), and TSFR Brand Leader Jake Schostak was on hand today to answer questions and walk my parents and I through the MOD ordering process. I normally am a "make your own" pizza type of girl, but today I opted for the "Squad Favorite" - ie, a favorite of the (MOD Squad, can we call them?) staff at MOD that isn't normally on the menu. 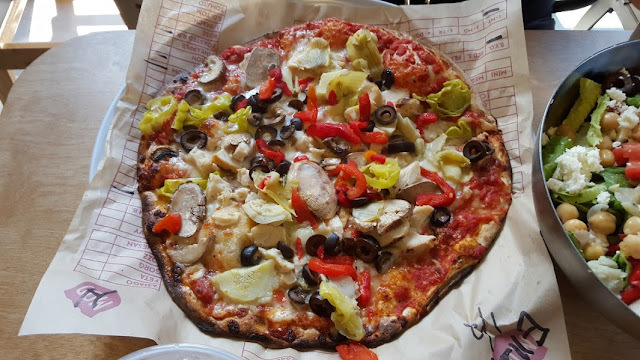 The Ulysses, as you can see above, includes garlic, fresh chopped basil, mozzarella, mushroom, parmesan, asiago, and gorgonzola cheeses; I also added red pepper, pepperoni, chicken, chopped garlic (my fave), and a pesto swirl at the end. 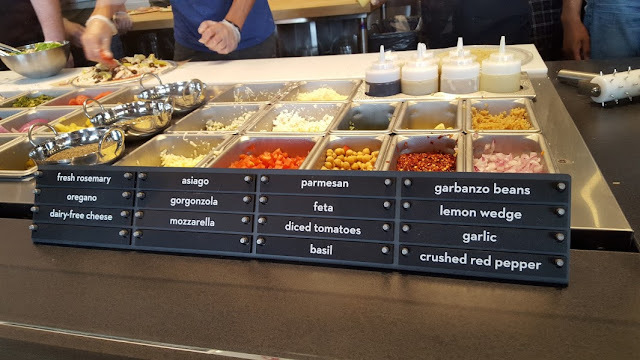 We were able to order anything we liked off the menu, so I also ordered the garlic strips, which come with your choice of dipping sauce (red sauce, pesto, ranch, or spicy ranch); we ordered it with red sauce and pesto but pesto was my favorite. My mom also ordered a cookies and cream milkshake (I LOVE milkshakes but I stole a bit of hers instead of ordering my own, since we already had so much food) and the cinnamon strips, which were one of my favorites and a definite standout on the menu ... they come with chocolate, strawberry, or cinnamon glaze (but go for the cinnamon glaze!). MOD also has specialty house-squeezed lemonades too, and I tried a berry one, which was good. The standouts of the afternoon were, surprisingly, not the pizza, although that was pretty good too. My mom loved the cinnamon strips (above) and her cookies and cream milkshake. My dad loved the pizza salad that he ordered - a salad with pizza toppings, served on an asiago pizza crust (see below). 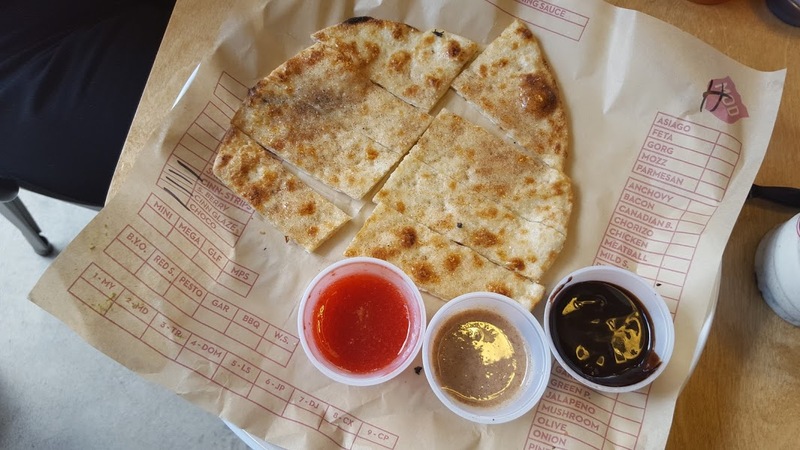 My favorites were the cinnamon strips and milkshake, as well; my pizza was actually a little salty, but I realized later it didn't have red sauce (it had no sauce on it, which is standard for the Ulysses pizza) so next time I'll do the make-your-own. 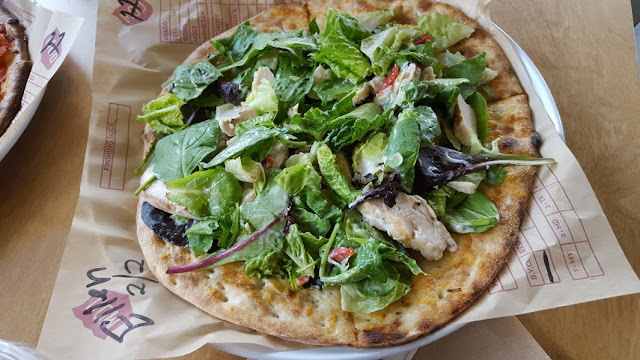 A MOD-sized pizza (standard 11" size - good for adults) costs $7.87; you can also order a mini (6" pizza) for $4.87 or a mega (double 11" crust pizza or family-sized salad) for $10.87; the MOD pizza salad (above) is $9.87. If you or your child is a picky eater, you can always order the "Maddy," which is a simple cheese pizza, for $6.37. Guests are able to write their name on a MOD sticker and affix it to one of the walls! Check out mine on the right. MOD Northville also serves Michigan draft beer, including Short's, and wine, by the glass, pitcher, or carafe; I noticed they had a good selection of sodas, too, including cream soda (my favorite). This Friday, August 14th is the grand opening of MOD Northville, and they will host an all-day "Pay What You Want" fundraiser (goes from 11AM until dinner service). The fundraiser will benefit the Main Street League, and during this time, guests can pay an amount of their choosing for their meals. 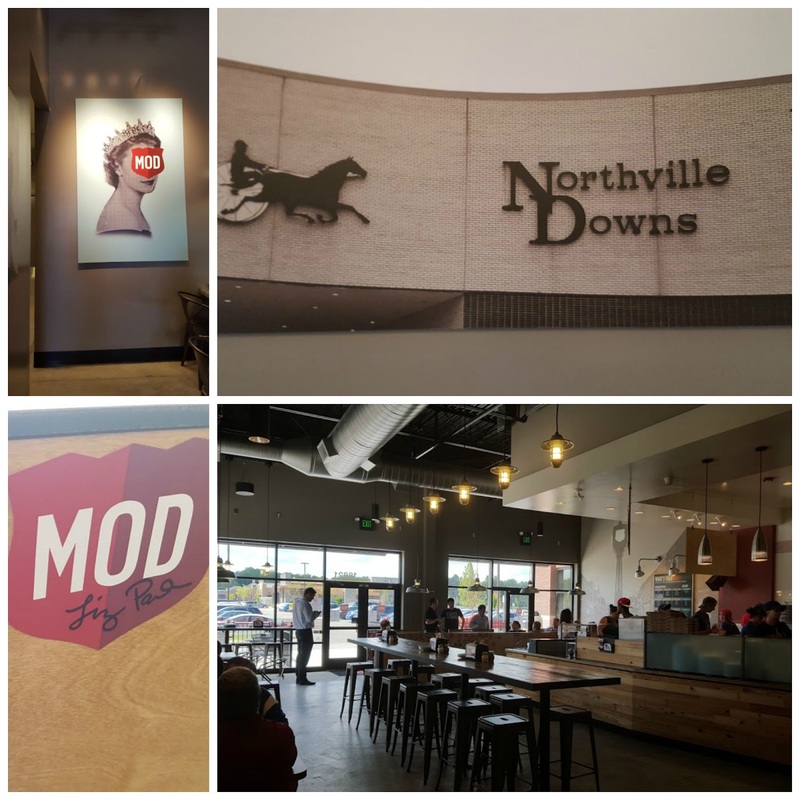 Michiganders: right now there are two MOD Pizza locations (Livonia and the soon-to-be-open Northville) but a Rochester location plans to open in September. Since I live on the west side of the metro area (Troy), I'm excited to try that one out when it opens. 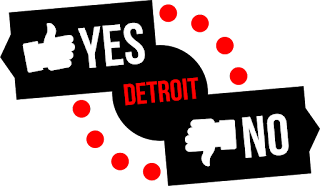 Schostak Family Restaurants also plans on bringing 25 MOD Pizza restaurants to Michigan during the next five years - wow! Have you ever eaten at a fast-fire pizza place before? What would you order off the MOD menu? 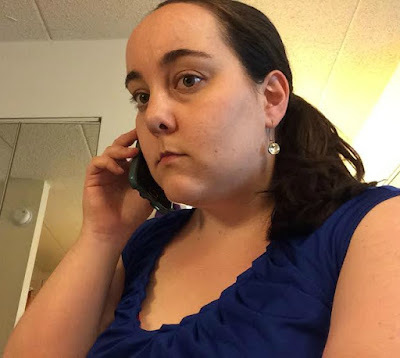 MOD Northville is located at 18821 Traditions Drive, Northville, MI, 48168, and can be reached at (248) 277-3620. MOD Livonia is located at 13229 Middlebelt Road, Livonia, MI 48150, and can be reached at (734) 245-0710. 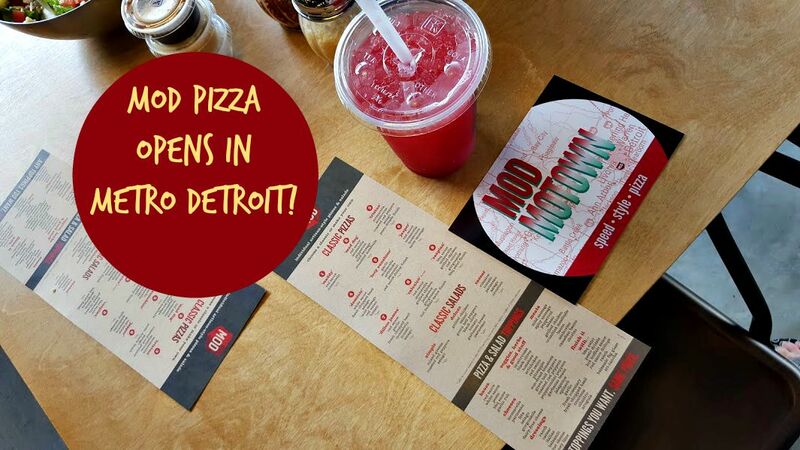 Find out more about MOD Pizza and its other locations at modpizza.com.